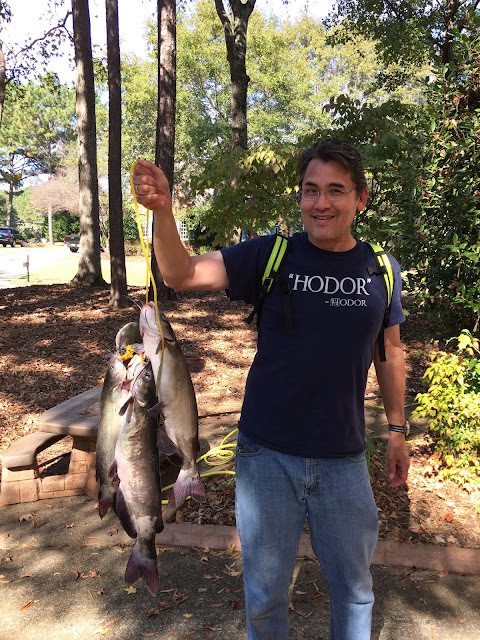 Last weekend, I caught a personal best catfish at a lake I hadn't fished before. It was the only fish I caught in two hours, but the size of it was so much bigger than what I've caught at my usual lakes that I decided I really need to try again. So on Sunday morning I went back. My second trip was even better. I caught 5 channel cats in about two and a half hours, weighing 4-6 pounds each. I actually brought my digital scale this time and measured some of them. Last week's fish was bigger (in fact, I'd raise my estimate of it a little now), but not by too much. The 5 fish I caught are probably 3 meals for my family of 2 adults and 2 children. On the day before, Saturday, I went fishing for bluegill to use as bait, but I got skunked. One problem was that the worms I bought the night before were dead! So I had to fall back to Slim Jim's, which I've seen work very effectively on YouTube, but so far I've had no luck with myself. The other problem was that the pond I fished was an unknown quantity for bluegill. I mean, it must have some kind of feeder fish since it's stocked with catfish and they have to be eating something. But I haven't seen with my own eyes anyone pull bluegill out of this pond, so I don't know for sure. In any case, I need to find a lake that is a known bluegill producer. And apparently I need to check the pulse of worms before I purchase them! I wanted bluegill for two reasons: One, to target bigger fish with cut bait, and two, to get more experience using circle hooks. Since bluegill were out, I decided to buy some raw frozen shrimp and try that. Now, I've read mixed things about frozen shrimp. The general consensus is that it works with small channel cats but isn't very effective for bigger fish. (Before you write to tell me about the monster you caught on frozen shrimp, let me just say: I'm not saying it never works. I'm just saying there are baits like, say, bluegill, that are known to be far more effective!) But hey, I still wanted to practice with circle hooks so I bought some shrimp. I defrosted 8 of them and sprayed them with some Dead Red Blood Spray to add more scent. Then I put them in the fridge overnight before my catfishing trip. On Sunday, I arrived at the lake at around 9AM. Since I have two catfish rods, I decided to use them both to compare the efficacy of punch bait versus shrimp. One rod was set up with a Santee rig and a circle hook for the shrimp. The other was set up for punch bait with a slip float rig using a #4 treble hook. I used a #4 instead of my usual #6 because that cat last week was really aggressive and swallowed the hook deeply. Bottom line: The score was 4-1 punch bait. One trip isn't enough testing to be thoroughly convincing, but so far it looks like I'm better off fishing with punch bait and eating the shrimp myself. The one fish I did catch on shrimp was the smallest of the lot – about 2.5 lbs. I had the rod with punch bait in my hands, but I kept an eye on the shrimp rod which I had on a holder. I saw the end of the shrimp rod dip a couple times, but it looked more like a fish was just nipping at it since it was dipping momentarily and not very deeply (due undoubtedly to the size of the fish). After a couple times of this, I decided I should check to make sure I still had bait and by golly, there was a fish on the end of the line! So the circle hook worked as advertised and self-set with a nice, clean hook-set in the corner of the mouth that was very easy to remove. Much easier than the treble hooks! I got one other nibble on the shrimp, but that time the fish didn't take it. I wanted to practice with a circle hook because in my general newbieness, I sometimes get overly eager with my hook-set, try to set too soon, and end up loosing the fish. So I wanted to make sure I had the patience to just let the circle hook do its thing, and self-set the fish. As it turned out, it's a lot easier than a "normal" hook. You just keep the line tight and wait until the rod tells you you have a fish, then you simply reel it in. In a way, it's anti-climactic because you don't get the thrill of the set. But man, getting that nice, clean, easy-to-remove hook-set in the corner of the mouth sure is nice. Especially if you're going to catch and release. The punch bait did well as usual. The bite was plentiful and I only missed the hook-set on a couple of them. These wild (as opposed to stocked) channel cats were more aggressive and fought a lot harder! One of the bigger fish did a nice aerial after he was hooked. And another one peeled drag (which had been set to about 5 lbs) and positively thrashed when I got him near the bank. I played them all in order to tire them out before they got to shore, but this one was particularly feisty. Now, I know in the wide world of catfishing what I'm doing is child's play compared to landing a monster blue or flathead, but it's all still really exciting to me! I mentioned that I rigged my punch bait rod with a #4 treble hook. I still deep-hooked the first fish with the #4. At that point it was obvious that I really needed to set my hook sooner so I worked on that the rest of the way and didn't have any more issues with swallowed hooks. My second fish was hooked nicely in the mouth, but I bent the crap out of the hook while removing it and effectively destroyed it. This was because I didn't have time to pre-order the #4 hooks from Amazon, so I had to go with what the local Bass Pro had in stock, which were standard strength trebles. It's very clear why Chad Ferguson recommends always getting 4X strength trebles. The standard strength hooks are a bit too flimsy for catfish. One fish did something that I'd read about but hadn't actually seen yet: as it got near the bank and I was reaching down with the lip grips to pull it out of the water, it went into a "death roll", turning over and over like an alligator with a deer. It made it really clear why putting a swivel on the line is a good idea! After I got him on the stringer he rolled some more and had twisted the stringer up into a knotted mess by the time I was ready to go home. Filleting big fish took longer and was messier than with small fish, but it was easier because of the size of the fillets. On the other hand, the residual odor after cleaning the fish was a lot stronger. I'm not sure if it's because they're bigger and have more surface area to smear their scent around, or if being wild gives them a more pungent smell. I suspect it's the latter. But in any case, the smell was more lingering than the other catfish I've caught and I cleaned up after myself very thoroughly. My freezer now has enough catfish to last us for awhile and I'm not one to stockpile just because I can. So I'm going 100% catch and release for awhile. Given that, I'm thinking about experimenting with using punch bait on a circle hook (using a sponge to keep the bait on the hook) in order to get cleaner hook-sets. Making the upgrade to the stronger treble hooks will save you a lot of time and frustration! Great catch and keep your lines tight! Wow, how cool is that?! The man himself! I'm a big fan, Chad. Thanks for the education, the encouragement, and the visit to my site!